We’d love your help. 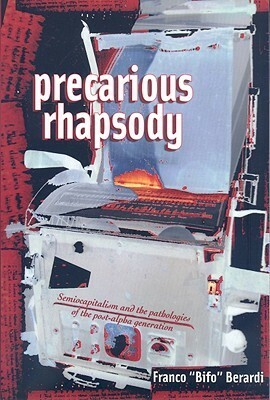 Let us know what’s wrong with this preview of Precarious Rhapsody by Franco Bifo Berardi. To ask other readers questions about Precarious Rhapsody, please sign up. This book is great fun; a genuinely enjoyable work of theory. Bifo has a certain reputation as the wild man of post-Workerist (aka Italian autonomist) theory - he was the real activist, spending years doing pirate radio, but he's also extremely bipolar, given to wild bouts of enthusiasm and troughs of utter despair - but somehow, often overlapping in his own unique signature way, whereby he can announce that revolutionary hope is dead, that the only possible remaining radical gesture is self-mut This book is great fun; a genuinely enjoyable work of theory. Bifo has a certain reputation as the wild man of post-Workerist (aka Italian autonomist) theory - he was the real activist, spending years doing pirate radio, but he's also extremely bipolar, given to wild bouts of enthusiasm and troughs of utter despair - but somehow, often overlapping in his own unique signature way, whereby he can announce that revolutionary hope is dead, that the only possible remaining radical gesture is self-mutilation, but do so in such a cheerful, playful, charming fashion that one can't help but feel invigorated by the experience anyway. (Plus he cured me of a terrible stomach ailment in Japan so I will always appreciate him for this, but that's another story.) One might say: he's the only person I've ever met that can be both manic and depressive at the same time. A veces un poco pesado, pero sin duda una interesante explicación del impacto que tiene en la sociedad un cambio de código lingüístico. Much weaker in comparison to his most engaging book *The Soul at Work*. Franco "Bifo" Berardi (born 2 November 1948 in Bologna, Italy) is an Italian Marxist theorist and activist in the autonomist tradition, whose work mainly focuses on the role of the media and information technology within post-industrial capitalism. Berardi has written over two dozen published books, as well as a more extensive number of essays and speeches. Unlike orthodox Marxists, Berardi's auton Franco "Bifo" Berardi (born 2 November 1948 in Bologna, Italy) is an Italian Marxist theorist and activist in the autonomist tradition, whose work mainly focuses on the role of the media and information technology within post-industrial capitalism. Berardi has written over two dozen published books, as well as a more extensive number of essays and speeches. Unlike orthodox Marxists, Berardi's autonomist theories draw on psychoanalysis, schizoanalysis and communication theory to show how subjectivity and desire are bound up with the functioning of the capitalism system, rather than portraying events such as the financial crisis of 2008 merely as an example of the inherently contradictory logic of capitalist accumulation. Thus, he argues against privileging labour in critique and says that "the solution to the economic difficulty of the situation cannot be solved with economic means: the solution is not economic." Human emotions and embodied communication becomes increasingly central to the production and consumption patterns that sustain capital flows in post-industrial society, and as such Berardi uses the concepts of "cognitariat" and "info labour" to analyze this psycho-social process. Among Berardi's other concerns are cultural representations and expectations about the future — from proto-Fascist Futurism to post-modern cyberpunk (1993). This represents a greater concern with ideas and cultural expectations than the determinist-materialist expression of a Marxism which is often confined to purely economic or systemic analysis.